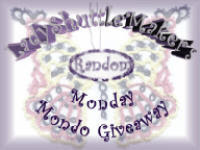 I participated in the Pay It Forward giveaway on Tudy's Craft Cupboard blog and now it's my turn. 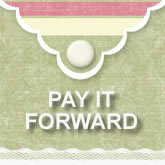 I will make something handmade for each of the first 3 people that signs up for my PIF. Then each of those people will carry on the PIF on their blog and in turn will send something handmade to three people, and so on. So who would like to receive a lovely handmade gift? And maybe even a little surprise with it. Just leave a comment on this post and make sure you have your email showing on blogger and I'll be in touch soon! Thanks! I will take just the first 3 that leave a comment and are willing to follow up with a PIF when they get the one I send. Are there any participants out there? Check out my new shuttle. It is beautiful! Chris and Erin do a wonderful job making their shuttles. Can't wait to try it out with my next project. It will with one of those new threads. The mail brought me these two beautiful threads from Tatilicious. First is Fancy Fields and then Rainbow-licious. Now, the hard part is choosing a pattern to showcase the thread the best. Unfortunately, I have not been tatting much since Easter. My new thread is calling me to get started on something creative.